The V-front Watkins Dominator is the stuff of legend, and a very rare and collectable amp nowadays. 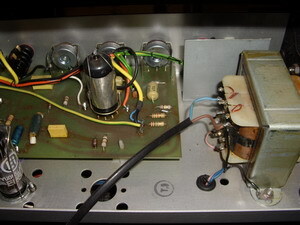 Although it's 17 watts precluded it being used on-stage by the main protagonists in the "beat boom" of the 1960s, just about every famous British guitarist either used one or coveted one in the days before they were famous. An icon! It made it's debut in 1956. Charlie says that he thought the angled 10" speakers would give a better spread of sound. 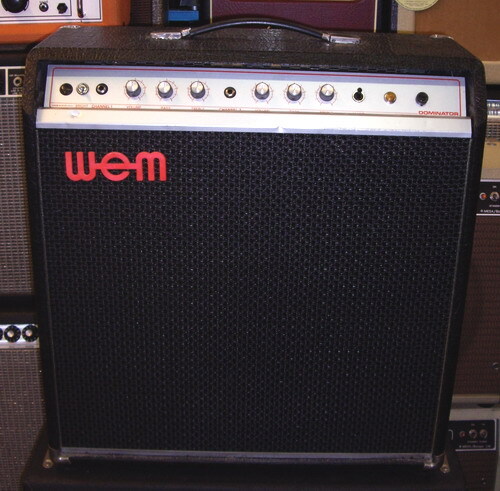 Maybe so, but they certainly gave the amp a uniquely distinctive appearance. Most are seen in turquoise & cream coverings : there may have been early maroon & cream and later black & cream versions. 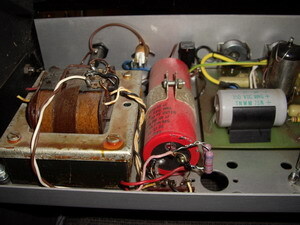 Early versions have a black control panel centred in the top of the amp. Later versions have a blue control panel positioned at the rear and wrapping around into the back panel. All seem to have Elac 10" speakers. 2 channels, 4 inputs and tremolo. 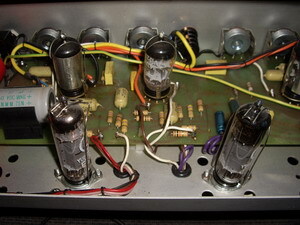 2 EL 84s provide the output power. In 1964 the V-front became to Dominator Mk II, in a styling perhaps considered more modern at the time. 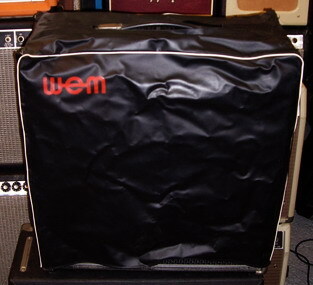 The chassis remained similar, control panel chromed, mounted in a tall rectangular black cabinet with red/gold diamond pattern on black grillcloth and a single 12" speaker (usually Goodmans). An all-but-identical Power Musette was introduced for use with organs, having a twin-cone speaker. 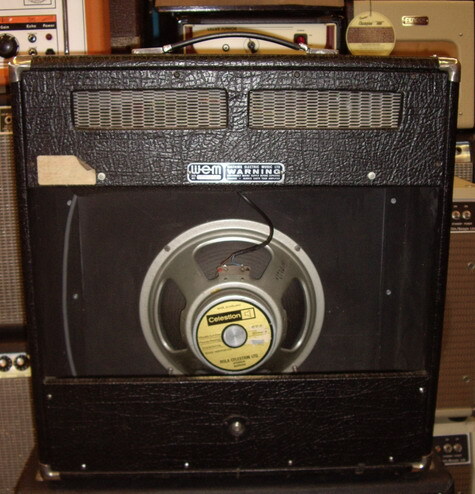 It stayed that way until circa 1970, when the Dominator Mk III was introduced in a large square 1 x 12 cabinet. The tremolo was omitted, either to reduce cost or because it was considered old-fashioned by that time. The Power Musette Mk II and Dominator Bass Mk I shared the same cabinet and chassis but had 12" twin-cone and 15" speakers respectively. 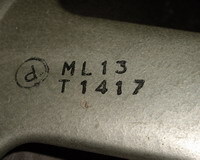 Later in the 70s more powerful EL34-equipped versions of the Dominator combo were produced - the Dominator 25, 30, 50 and the solid-state Dominator 100. Some were made as "piggy-back" head & cab versions. It seems that Dominators were still being made when Wem closed down in 1982, a 25-year run. Up to very recently, Charlie still offered a re-issue version of the V-front, updated to the modern player's requirements.